And it made me wonder how often we excuse ourselves from doing something because we think we aren’t capable. Because we see others who are doing it well and assume they wouldn’t have had to face the same obstacles that we believe we do to achieve our goals. That somehow they naturally have the qualities needed to accomplish whatever they’re doing. And we shrug it off, dismissing our dreams, because we simply aren’t “naturally gifted” to do it. "People from my first home say I'm brave. They tell me I'm strong. They pat me on the back and say, 'Way to go. Good job.' 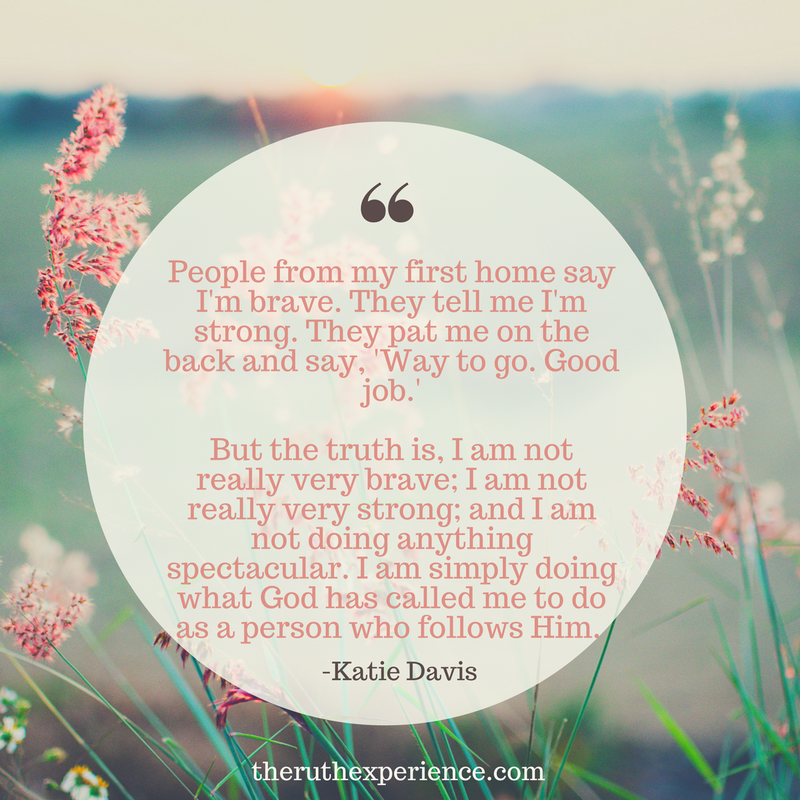 But the truth is, I am not really very brave; I am not really very strong; and I am not doing anything spectacular. I am simply doing what God has called me to do as a person who follows Him. He said to feed His sheep and He said to care for 'the least of these,' so that's what I'm doing, with the help of a lot people who make it possible and in the company of those who make my life worth living." And as I’ve pondered my own insecurities I wonder, Why wouldn’t God want to use someone who didn’t quite think they were capable in themselves? Would he want someone who was completely confident in themselves, never having to rely on him as their source? Wouldn’t he want to fill in the gaps where I lack? So. Here is my encouragement to you, to me, to us, today. What is it that God is calling you to do? What dream have you left on the shelf because you just didn’t think you were capable? What step of faith is God asking you to take, right now? Because in all honesty, it’s okay that I’m just a mediocre mom. It's okay that I'm imperfect. As long as I remember that I can lean on God for wisdom, trust him with my dreams (including these kids he's given me), and rest in the fact I have everything I need for this life, in Christ. He will make up for any deficit, any lack, that I have. I'd rather recognize I'm mediocre and that I need Christ to get through the day, than think I've got it all together! Awesome post,Kendra! I can totally relate to what you said (especially about being mediocre.) Great encouragement. I am thinking this is just what God wanted me to read today, because I actually came to read your most recent article (which I did start with), but ended up here and this speaks to issues very relevant for my husband and I lately. I'm going to share it with him too and pin it for future re--reading! Thank you for this!